The hostels listed here in Vigo and the surrounding areas are all terrific options for anyone who is watching their budget and wants to stay in a less expensive, cheaper place. 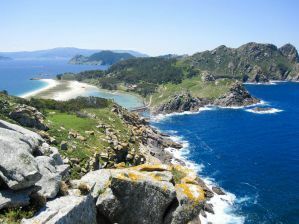 Hostels in Vigo are limited, so don't be afraid to check out some of the budget hotels or bed and breakfasts. Many of these establishments, although lacking in social atmosphere, make up for the value with their great hotel amenities. Give them all a look before making your reservation. How much do hostels in Vigo cost? This very modern and clean hostel in the middle of Vigo is close to shopping, dining, and other activities. Although it's not in the older part of town near the port, it is a very short but ride away or a long walk, so you can get there in minutes. With plenty of room for everyone and lots of beds, this hostel is very comfortable. Common areas have TVs with game consoles, a pool table, and more. Parking also available for those that drive. Free Wi-Fi is also available, as is laundry, luggage storage, and other typical hostel/hotel conveniences. A shared communal kitchen is on premises for those who wish to cook. Also, a fitness center and exercise room is located on the ground floor. Guest reviews are good but not great, citing the lack of atmosphere and hot conditions in the summer. They do receive high marks for cleanliness and the friendly staff, however. The Alda Estaion is a budget-friendly hotel with very clean, modern rooms in a terrific location close to the heart of Vigo's historic center. It's obvious that this building has been refurbished, and a terrific job was done. Private rooms with ensuite bathrooms are all decorated nicely, kept very clean, and have modern facilities such as Wi-Fi and TVs in the rooms. Some of the rooms on one side of the building have terrific views. A rooftop balcony also affords the guests a great view overlooking the city and the port. Shops, restaurants, and the art museum are nearby. A 20-minute walk will get you into the heart of the city, or you can take the bus. Luggage storage and bike storage are also available. This hotel is a great option for anyone traveling on a budget, although it is not a hostel. Just steps from the beach on the bay is this gem of a bed and breakfast with affordable prices for everyone. Not only is it close to the water, but also to the small Vigo suburb of Cangas just across the water. Here you will find plenty of restaurants, bars, shops, and entertainment. The hotel itself offers private rooms, all with ensuite bathrooms, terraces, and TVs. The rooms are nicely decorated, and bathrooms are clean and modern. Also on offer are larger apartments for those who want more space or perhaps for families. A terrific free breakfast will start off your day before you head to the beach, in to town, or take part in any of the other activities the area has to offer. They also offer various room service dining options featuring fresh local seafood. Free Wi-Fi, luggage storage, bike parking, and an onsite bar and restaurant are also on the list of amenities. For the price and value, you can't go wrong here!